In the warm waters of the National Cañaveral Coast in Titusville, 17 sea turtles returned to their natural environment after specialized care of the SeaWorld Orlando rescue team. Most of the returned sea turtles were rescued in New England and flew to Florida for treatment at the end of last year. At the beginning of last December, more than 40 turtles of Kemp’s aquatic subspecies parrots, stunned by the cold, arrived at the Tampa International Airport, to begin rehabilitation in multiple facilities in Florida. The reptiles were rescued from the icy waters of the north by the Massachusetts Audubon Society and stabilized at the New England Aquarium before being moved to the State of Florida. Upon arrival in Orlando, the SeaWorld rescue team conducted comprehensive tests to determine the best treatment for each sea turtle. Many suffered from pneumonia while others were treated for corneal ulcers and malnutrition. After three months of individualized care, the turtles were discharged to return to the ocean. Rescued early this winter on the Atlantic coast, two green sea turtles also returned to the sea. One of the turtles was treated for abrasions of shells and the other for injuries caused by fishing lines and ingested hooks. Dr. Lydia Staggs, one of SeaWorld’s veterinarians, successfully performed the challenging hook extraction surgery, and both animals were allowed to return together with Kemp’s Kemp’s ridleys, which are in serious danger of extinction. 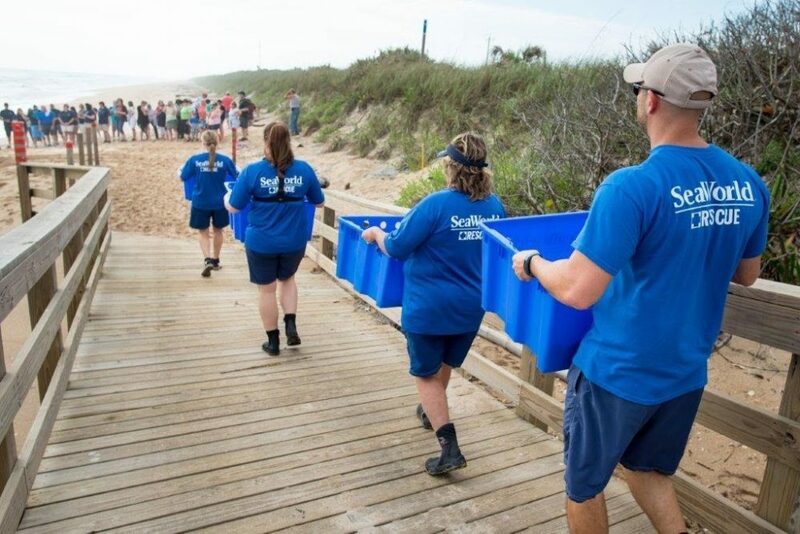 In collaboration with government agencies and associated marine life centers, more than 2,000 sea turtles have been rescued by the SeaWorld Orlando team since 1980. For more than 50 years, SeaWorld Parks & Entertainment has helped animals in need: sick, injured, orphaned or abandoned, with the aim of returning them to the environment. More than 31,000 animals have been rescued by the expert animal rescue team that is on call 24 hours a day, 7 days a week.